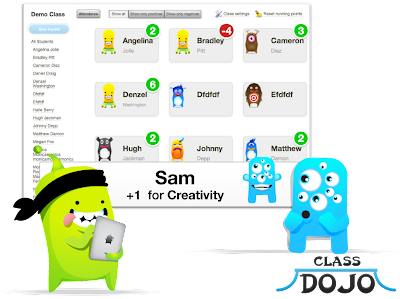 I've been "hearing" about Class Dojo, a free behavior management tool, through Pinterest and kind of filed that into a far away corner of my stuffed brain. Last night I stumbled on it again and decided to check it out. I just wanted to know what it was all about, I wasn't expecting to immediately sign up for it and try it out today! Class Dojo is probably old news to a lot of you, but it was so fun and worked really well! It took only about 20 minutes for me to understand how it works and get my class set up. Basically you can set up a class with student avatars. You can give positive awards and negative awards for different behaviors. 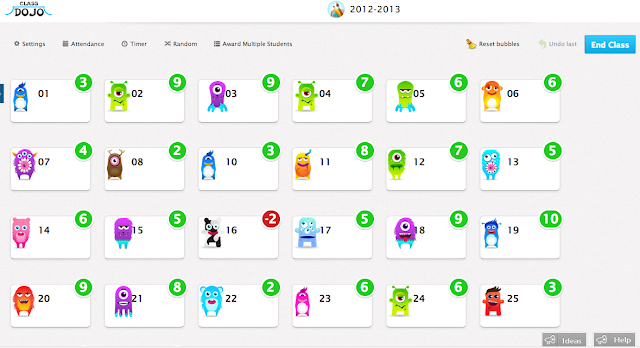 Class Dojo keeps track of how many each student earns or loses during the school day and then tracks the data. This data can be shared with students and parents! The dojo can be displayed and teachers can connect with their mobile device (Android or Apple) to remotely give awards. So not only does that allow teachers to move about the room and give awards, but they can be given outside of the classroom, like in specials or at recess. This morning I didn't tell my class what it was, they just suddenly saw monsters on the board with their student numbers (I used student numbers instead of names because of FERPA privacy). Several students walked up to the board to get a closer look. As they were up there discussing what it was I began to give "awards" to those students who stayed in their seats and were on task. I did this from the opposite end of the room with my phone. Suddenly they began to hearing the dinging and see the message on the board that someone had gotten an award for being on task. The lightbulbs went off and those at the board realized that there were not on task and went straight to their seats and got started. This continued further into the morning as students continued to work hard and hear dings as students received awards. The first negative award came and they quickly realized what the new buzz sound was. I refused to answer their questions and asked them to wait a bit until I explained what it was (I was already hearing students discuss the avatars). Finally I showed them the student video and gave them a quick overview of what I was doing. Basically I told them that it was something I had heard about and wanted to try out in class. If it worked with them in the final weeks of school I may use it for all of next year. And, I explained that they could get to customize their avatar. I sent home the student codes and within an hour of school being out I already noticed that many students had logged in and changed their avatar! At first thought I figured that it would be a lot of work and a bit cumbersome. I was so wrong! I was having just as much fun as the kids! I wanted to give those awards often! Sometimes I gave the awards straight from the computer (I don't have a smartboard) and sometimes I used my phone (while I was around the room). The most exciting part of today was the amount of work my students accomplished and the comments about how the day went quickly yet they felt like they go so much done! Guess which teacher will be using Class Dojo again tomorrow? Who else is using Class Dojo? Tips? Advice? Hated it? Loved it? 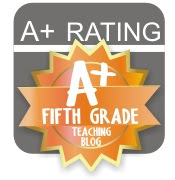 I hope FourthGradeFlipper allows me to post this as my Tried it Tuesday Thursday! Class Dojo seems to be gaining popularity this week! 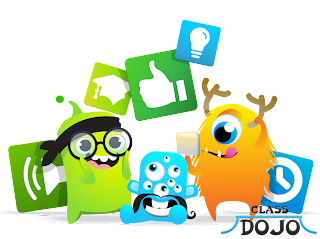 Go check out the other Class Dojo posts! I'm taking my class to the computer lab tomorrow so they'll all get a chance to change their avatar, some were obviously excited to get started today! I even told my principal about it and he is coming to check it out. Thanks for hosting the link up Holly! I tired it out during my first practicum as a student teacher and it was a huge hit!! The kiddos loved being able to customize their avatars and the noises it makes really grabs their attention. I also love the app because it allows you to monitor behaviour during assemblies or even while outside as a class! Hi Ms. W - Kalen from ClassDojo here. Thanks for taking the time to write about the site - we really appreciate the support!